While you may have had some success with organic Facebook traffic, thanks to a strong marketing strategy, there could come a time when you want to do more. If you don’t know what you are doing, you could easily blow through thousands of dollars, with nothing to show for it. Facebook wants you to spend money on advertising. The social networking giant wants you to achieve success. This is why it provides so many tools, as well as the ability to get started for as little as $5. For those times when you need help, for advertisers who truly care about saving time and money, there are several Facebook advertising tools to consider. Let’s take a closer look at 11 of these tools. What better place to turn for advice, information, and guidance than Facebook itself? Through Facebook Ads Manager, you have access to all the tools necessary to create targeted ads meant to reach your audience. This is the most basic Facebook advertising tool, but that doesn’t mean it has nothing to offer. If you plan on advertising on Facebook, you must understand how to use it. Choose the appropriate audience for your ad. There is no two ways about it: this is the one advertising tool you need to fully understand if you plan on reaching your goals. Fortunately, Facebook makes it extremely simple to get started. Are you the type of person who is spending less time on your desktop and more time on your smartphone and tablet? There are billions of smartphone users worldwide, with this number expected to grow even larger over the next four years. Facebook is aware of this, and that’s why the company has dedicated so many resources to providing a strong mobile experience. But there is more to the mobile experience than updating your profile and communicating with others. You can also use its Ads Manager App to control all your campaigns, all without the need for a desktop computer. Watch this video for a brief overview of the app. If you haven’t used it to date, now’s the time to make the switch. One of top platforms for creating Facebook advertising campaigns, Qwaya is the perfect solution for experienced marketers. If you aren’t A/B testing your ads you’ll never know where to spend your money in the future. With Qwaya, this is never an issue, as you can test every variable imaginable, ensuring that you know what’s performing best at all times. From ad type to placement, use this feature to get more out of every dollar you spend. The more campaigns you run, regardless of the platform, the more difficult it is to track what’s active and what’s not. Unless you use the Qwaya scheduling tool. This allows you to schedule campaigns at times when ROI is highest. Why run ads when your target audience isn’t online and ready to buy? You need to schedule your campaigns based on targeted days and times. I’ll be first to admit that Qwaya is not as easy to use as some Facebook advertising tools. I am also comfortable saying that its features list is among the best. If you have Facebook advertising experience or are willing to go through the learning curve, Qwaya deserves your attention. Have you ever used an advertising tool that is entirely too complicated? You know it could work for you, but you don’t have the time, experience, or knowledge to put it to good use. Clean, easy to understand visual analytics. Customizable dashboards, allowing you to pinpoint top performing ads and focus on the numbers that mean the most to you. Detailed metrics for those who want to dig deeper. With a variety of training tools, all of which are free of cost, you’ll never find yourself lost and searching for answers. For example, there is an entire section on how to create your first campaign, complete with a video that walks you through the process. If you were to ask me which Facebook advertising tool best suits everyone from beginners to seasoned professionals, I would answer AdEspresso every time. You can’t argue with the fact that Hootsuite is one of the biggest names in social media, with millions of brands and individuals using the service to schedule updates. Hootsuite Ads allows you to take your Facebook advertising campaigns to the next level. The application automatically scans your Facebook Pages, seeking the best posts to promote to your target audience. Assistance defining goals for each ad, allowing you to tailor your campaign to achieve maximum results. Advanced ad management features, allowing you to spend less time on ads and more time building your business. Gain access to a central location for managing both paid and organic content. Take the guesswork out of social media advertising. Our automated targeting and bidding algorithms will turn you into an ad expert. You can’t argue with that. With no guesswork, your confidence will soar. As a Facebook Marketing Partner, Social Ads Tool is a trusted provider with the primary goal of driving advertising success on Facebook. Every Facebook advertising tool has a list of features that sets it apart, and this one is no different. Automatic ad optimization. With this feature, the optimization engine calculates your bid and delivery based on ROI, CPC, and CPA. Deep reporting. For those times when you need more information about your audience, you can generate ad, hourly, and keyword analysis reports. Conversion tracking. A key to your success, conversion tracking allows you to understand what is and is not working. New features added without delay. When Facebook releases a new feature, Social Ads Tools is never far behind. This helps protect against lost time and money. It may not be a “Facebook only” tool, but AdStage still has plenty to offer advertisers. Create, Optimize, and Report across your search and social ads in one place. Monitor and drive better performance for your ad campaigns with Automated Rules in AdStage. Save time optimizing campaigns with rules that schedule your campaigns, alert you based on performance, pause campaigns, increase budgets, and more. If it has anything to do with driving better results, while still being able to save time, I’m all for it. 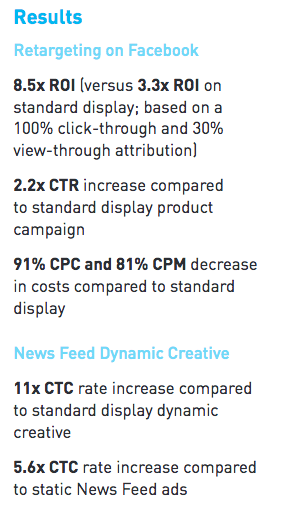 With the help of AdStage, your Facebook advertising campaigns are always in good hands. With many top brands relying on Driftrock, including Coca-Cola and BMW, this tool must be something special. And once you learn more about the features, you will see that this is the case. Forget about turning on and off your campaigns based solely on time of day. You can now use a variety of other signals to ensure that your ads are only running at the optimum time. This improves your chance of a positive ROI. Still not sure if Driftrock is right for you? Check out this excerpt from a recent blog post:On the Ad Tech side, we help brands engage with audiences on Facebook at scale, while delivering messages at the perfect time through triggers such as what’s on TV or the latest sports results. For example, BMW used Driftrock Triggers to build awareness for BMW xDrive 4X4 technology when it rained or snowed, resulting in a 30% increase in ad engagement. You tell me, how cool is that? Retargeting on Facebook is all the rage, as it allows you to reach customers when they’re most interested in what you have to offer. They leave your website without completing the desired action, such as making a purchase. While using Facebook, they are presented with your retargeted ads. They click on the ad, returning to your website to complete the desired action. I like everything about AdRoll, especially its cross-device reach. This allows you to reach potential customers regardless of the device they are using, including smartphones and tablets. As you may know, I am a big fan of remarketing. If you need help in regards to Facebook retargeting, AdRoll can act as your crutch. Facebook retargeting isn’t the same as traditional advertising, so don’t rely on just any tool as you get started. Find one, such as AdRoll, that focuses on this form of advertising by providing access to the high level features you need to succeed. Similar to AdRoll in many ways, Perfect Audience is a Facebook retargeting tool. When customers leave your web site without converting we serve your ads to them on Facebook. Perfect Audience isn’t the most sophisticated Facebook retargeting tool, but it gets the job done. Increase the scale, performance and ROI of your Facebook ad campaigns through our advanced product and services. While you can use AdSpringr for personal campaigns, it is often used by agencies that manage advertising for a variety of clients. It doesn’t matter if you are managing your own campaign or doing so on behalf of clients, AdSpringr has a way of saving you time and increasing revenue. More than 900 million people visit Facebook every day. You can either ignore this audience, or do whatever it takes to turn some of these people into paying customers. Once you create a profitable Facebook advertising campaign, you can scale it accordingly. Maybe you want to spend more money on this strategy. Or maybe you need to step back because you can’t handle all the business you are generating. It’s up to you. Facebook is one of the most popular websites in the world. Through advertising, you can quickly reach this audience. Previous Post What Is Your Marketing Plan? How Can You Keep Them On Track? Next Post What Exactly My Customer Wants?